Today I upgraded my trusty Arrow Jpole (OSJ 146/440) with a brand new Tram 1481, which I purchased from Amazon for 79.99 shipped. Wow, this is a BIG VHF/UHF antenna. It looks like a small CB antenna, much like the Antron 99. It has 3 small steel radials at the base, which aren’t too noticeable. It’s supposed to be fiberglass, but it sure seems to be PVC (?). It was easy to mount for the most part, although the supplied brackets wouldn’t hold to the aluminum mounting tube while the lock washers were attached as the screws were too short. removing the washers and adding thread locker fixed this. Before mounting I tested a few far-off repeaters on VHF and UHF and recorded their signal reports. I also monitored various marine frequencies, presumably from nearby Dana Point. With the J pole antenna I can only faintly pickup just a handful of marine channels. I installed the 17′ antenna on a 10′ 1.25″ piece of steel conduit that I painted white, to match the antenna. The push up pole is mounted atop our back yard trellis, which is ~10′ tall. Ground to the antenna base is about 19′ up, and ground to antenna tip is about 36′. No guy wires necessary as the steel conduit is very rigid. Now to the on-air results! I was very pleased to find both VHF and UHF reception increased markedly. I’m only using the digital bar meter on my FT-7800R to compare, but VHF jumped from 5 to 7 ‘bars’ and UHF went from 4 to 6 bars. Additionally, I can hear a whole host of new chatter on the marine frequencies. SWR is either good or perfect across 2 meter and 70cm. The highest SWR was on the bottom of 2 meter and reached a peak of 1.7:1. The middle to top of the band was 1:1. So far I’m pleased. I’m a bit skeptical, however, because the reviews on eHam are a mixed bag. Southern CA is very dry by nature, so hopefully the moisture issue that’s plagued many others won’t be such an issue here. I’ll be sure to keep my SWR meter connected to make sure I don’t miss a problem! It’s finally happened, we bought a HOUSE and are out of the Condo. Never again will I need to attic-mount my antennas or fight the HOA! No shared walls, no attached neighbors, it’s awesome! We’ve been here a few months, but haven’t had time to dedicate to the hobby. Today was the day! I used my day off today to unbox some of my gear and climb in the attic to run coax for a j-pole and a home-brew wire antenna. I also ordered a 100′ roll of LMR400 for my vertical, which is pending planning and installation. 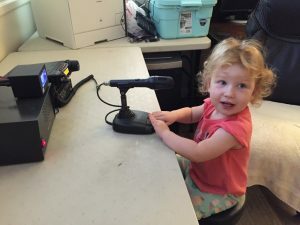 After I did a rough-in connection to test my gear I was pleasantly surprised to find my 2 year old very interested int he mysterious voices coming from the radio. Without any instruction, she naturally knew to press the microphone button and say “Hello?”. We have a little ham in the making! 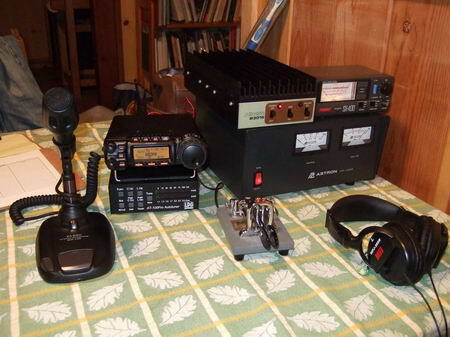 After at least a year off the air and TWO years off the blog, I plugged my trusty FT-857d back in and tuned in to the local VHF SOARA repeaters. 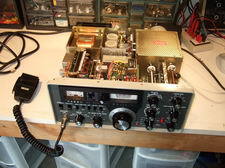 I gave a quick shout for a signal report on the Laguna Beach repeater and received an immediate reply from Ray, AE6H. Although I mistakenly called him Richard. 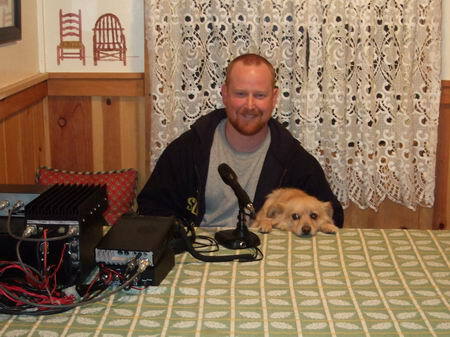 Hey, it’s been a year off the air – forgive me. Thanks to Ray for the quick sig report. It was “full quieting” BTW, thanks to my Arrow OSJ146 Dipole. Good to know all my equipment is still working perfectly, besides being shelved for a year. I was a little surprised that the 857 hadn’t forgotten any memory settings, but I guess the programming is ROM based instead of volatile RAM. Although I couldn’t find the cause of my FT-101E’s low output on 160 meter, I did finish the alignment of the other bands. Amazingly, the radio is peaking at 110-120 watts on 15-80 and 100 on 10 meter. Why is it amazing? These are the original tubes! I also took the time on the bench to repair the VOX switch and replace the mic cable of my Shure 444. After reassembly, I set it up temporarily in my office to play around on 40 and 80. Considering the limitations of my attic dipole antenna, I was pleased to ragchew on 40 and 80 for several hours. Before bedtime, I tuned back to 40 meter to listen to some of the broadcast stations coming in from overseas. I love the QSB sound of a broadcast station while listening on my FT101. The smell of the tubes, the warm glow in the evening… Some of the many reasons I will never part with this radio. This week I dusted off my FT-101 line and put it on the bench. It’s been out of commission for about a year and I wanted to make sure it’s still functioning. I’ve missed playing with this awesome rig and wanted to twist some dials on a “real” radio. After setting it up on the bench and connecting the matching FL-2100B amplifier, I found that I didn’t fully remember the tune up procedure. I remembered about dipping the plate and tuning the preselect, which is the basics, but I couldn’t remember what plate current to watch for or the proper loading settings per the manual. This brought about some experimenting; After following the tune-up procedures per the manual, I discovered that advancing the LOAD setting on the radio produced an additional 10% output on SSB. I vaguely remember hearing another FT-101E user recommending this tactic. Also, after tuning up the amplifier I found that output was only 250-300 watts SSB. Yes, the ALC wiring is connected to the back of the amplifier. AC power is 117VAC. Is the radio limiting output to the amp too much (ALC) , or is the amp not putting out full power? Wifey and I spent four days in Idyllwild last weekend, as we do every year to get away. I set up a modest antenna farm consisting of a 102′ G5RV, Imax 2000 vertical and Arrow 2M/70cm J-pole. 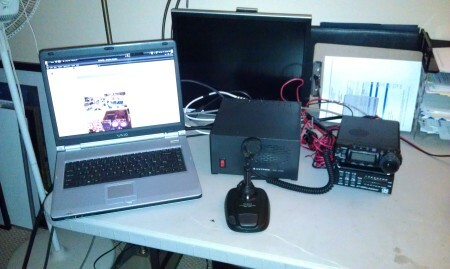 The rig, as usual, was my trusty FT-857d, LDG AT100 Pro tuner and Astron RS35M power supply. I venture into the depths of 10 meter CW… My RCI-2950 isn’t the best candidate for this mode. I wish I had brought my FT-857d instead! Either way, it was nice to hear signs of life on 10M CW. 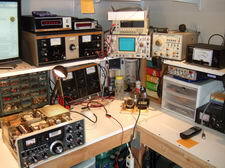 Today and tomorrow is the ARRL 10 Meter CQ contest. This short video was shot in my Jeep while listening to K7SS in WA handle contest traffic. 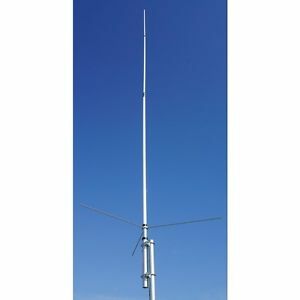 Rig is an RCI-2950, amplifier is a Texas Star DX-400 and a 102″ antenna. Location was (stationary mobile) from Misty Ridge in San Clemente.